Did you find a TOKENS AND OMENS painted stone? Leave me a note in the comments on where you found it and the token or omen on the stone. These are a few of the stones being left in the wild! This entry was posted in tokens and omens, Uncategorized and tagged painted stones, stones, tokens and omens, ya fantasy, young adult. Bookmark the permalink. Yes! I was on a walk with about 20 of my kiddos at Riverbottom. We were walking along the river and a student found it in a tree. The token on it was a tree. Thanks so much for letting me know! I appreciate you posting! : ) We loved this turtle. Was just the highlight of our day. If you are ever in the Virginia Beach area and looking for a hair salon come on in, and bring the turtle too! shearblissvb. com and you can schedule online! My boss found the turtle one in Montrose, Colorado. I hope your boss enjoys it! The turtle is a token earned by being patient! Yes! We found a stone at Riverbottom Park in Montrose, CO. I was on a walk with about 20 kiddos when one of my students found the stone in a tree. The token was a tree. I was in Bethel, Maine for Molleyockett festivities and found one on the library steps, it was a peacock. My younger sister then found a butterfly one at the base of a tree and then another, a turtle on the fountain. We will definitely be buying a book or two, I thought this was a lovely advertising idea. We actually assumed they must be from one of the booths and searched it out for awhile. Oh, I’m so happy you let me know! A friend set them out for me. I live in Colorado, but have people in 32 states leaving the stones for me. Thank you – I’m glad you found them! So excited for you! Can’t wait for mine to come in from amazon! Best wishes on your book tour! I left two stones outside the Leland Branch of the Brunswick County Public Library in North Carolina. I left one outside the Monkey Junction Branch of the New Hanover County Public Library. There are two stones waiting for some lucky people at Halyburton Park in Wilmington, NC. There is one stone on the bridge in Hugh McRae Park in Wilmington, NC. I left one outside Panera on Oleander in Wilmington…and tomorrow I will leave one on the boardwalk at the beach in Carolina Beach, NC. Good luck everyone! My son was walking in the park in Charleston, Illinois and found a snake token! This is an awesome idea and he loved that it really means something!! Makes me happy that he was excited to find it! The snake is an omen in the book. I was getting my hair done in Charleston, IL at Libby’s salon. I like to snoop around to see what’s new, and I found this stone with a snake on it. I happen to like snakes, non-poisonous ones, of course. In Lithuanian culture, they symbolize luck. That’s awesome! Thanks for letting me know. And I’m glad you like snakes. It’s an omen in the book! II was visiting my Sister in Olympia, Washington. On Friday, we were at the pier area and my Sister found it at the foot of ‘The Kiss’ statue. But it was meant for me and we both knew it. At first, holding it horizontally, I thought she was a mermaid, but now I see that vertically, it’s not a fin but roots growing into the ground with a vine growing up around her. I was thrilled but didn’t know if I should take it. I’m so glad I did. Thank you! I have 2 grandsons who will be receiving your book at Christmas! You found Moira – Fate from the book! She’s the rarest one to find, as she was intended as a gift for the people placing the stones. Some decided to give them away. Thanks so much for letting me know you found her and for buying the book for your grandsons! I was in Bethel, Maine last week at the Molleyockett fair and that is where I found Moira on the used book table. The man I was with who is from Bethel, told me that weekend about his sister who died at the age of 46 and her name was Moira! I looked up your website and will order a book from you. Thank you and I am showing this token to others. What serendipity! Or Fate? I’m amazed how life brings things together like this. Thanks so much for sharing! I found what looks like a sparrow. I was with my kids at a playground in Naples, Fleishman Park. It totally made my day! I’m so happy you let me know! A good friend left those in Naples for my book promotion. Enjoy! Hi Jeri – My daughter found the turtle token on a bench at the Maple Grove, MN library. She’s so excited and calls it her ‘magical, special’ stone. Lucky us – thank you for your creativity! I love that she calls it a magical, special stone! She sounds pretty special herself! Thanks so much for letting me know you found it. I’m friends with your niece, Sarah, who shared some hints on where to find these beauties. I found a butterfly token on the cannon of a war memorial in downtown Effingham, IL! What a fun treasure to have. Best of luck on the book release – can’t wait to grab a copy for myself! I might have given away her secrets when I posted the pics on FB! So glad you found one – thanks for posting here. In TOKENS AND OMENS, the butterfly token is given for fasting and counteracts the pig omen given for overindulgence! I found a token outside the post office in Warrenton, VA. it’s a cute lil pig! I was just passing through the main street after dropping something off at the post office. such an inventive way to promote your book. Thanks for letting me know! My niece lives in Warrenton and placed stones for me. The pig is an omen given for overindulgence! That one’s kind of obvious. In the book during the quest, the pig omen becomes a dangerous razorback pig that can be overcome by using a butterfly token. I love the stone my daughter and I found in North Houston, Texas with a beautiful butterfly on it. Butterflies are my FAVORITE and I see them as my sign of Promise for good things to come. Made our day :). Thank you Jeri! Thanks so much for letting me know! The butterfly stone is one of my favorites too. In the book, they’re given for fasting and counteract the pig omen given for overindulgence! But I like your idea of butterflies as a sign of Promise. My niece set that one out for me – I’ll let her know you’re enjoying it. Jeri we found the best token in the world!! It has a bee on it!! Even better, to me and my family of 5 GT grads, it is the Georgia Tech yellow jacket. We found it in Wicker Park sitting on a much larger stone off the newly done 606!! Being in Chicago, we couldn’t believe we found an Atlanta symbol all the way up here!!! Love it. I am fighting my kids to keep a hold of it. Now I have to read the rest of this site (and book) to figure out what is going on. Oh, Chris! I love your note! I’m still laughing – thank you! This is so awesome and I’m thrilled that the hornet means so much to you. I believe in serendipity and this certainly fits. To celebrate the release of my book, I had people from all over the country leaving stones for me. The hornet is an omen given for anger in the book. During a quest, the omens become actual threats and the hornet is counteracted by the turtle, given for patience. Enjoy and thank you for letting me know you found it! I found a scorpion token outside of the Post Office in Mattoon, IL. What does this mean? The scorpion is an omen given for envy! The dove, given for kindness, counteracts it in the Quest. Thanks for letting me know you found it! Thanks for letting me know! I just left it today on our motorcycle ride to Creede! I’m so happy you like it! We left it a couple of weeks ago when WE were out on a motorcycle ride! It represents Fate, who is a character in the book. I found a rock with a tree on it. In the quad of Illinois State Univeristy in Normal, Illinois. What does the tree mean? The tree is a symbol used in the book for drawing energy from nature and working together. Thanks for letting me know you found it! 😊 My niece placed it for me. We found a stone with a pig on it on the shelves at the Wilderness Branch Library in Locust Grove, Virginia! That’s awesome! Thanks for letting me know. My sister lives in Locust Grove – I’ll have to check with her to see if she left it there. I found a hornet omen in Charleston at Bob’s Books! 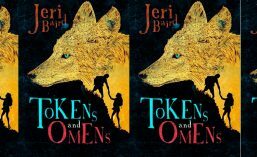 I really enjoyed Tokens and Omens and I’m looking forward to the next book!! Now I need to earn a turtle to offset my hornet!! The book is amazing, you did an fantastic job!! Yes! You need a turtle token! Thanks so much for coming last night. It was great to see you, RJ! Thanks so much for coming! I loved seeing you too, and I’m so happy you found a token! I have a dozen stones that I’m using for my talks this week. Might leave them around the square on Friday! My partner and I found one sitting on a rock in the Uncompahgre River this past weekend on our way from Ouray, CO to Silverton! I felt like it was meant for us to take and keep, but was certain I would look you up to check on your intention for the stone. Such a delight – we were married the Friday before, so this was special. Congrats on your wedding! I’m so happy you found the stone and that it can be a reminder of a special time in your life. Thanks for letting me know – you made my day! Super cool. My daughter found one under the antler arches in Dubois, WY. Our family is on a year long vacation traveling across the country in our RV and we are constantly looking for cool rocks and semi precious stones. This was definitely a cool find. I can’t wait to look into the book. Thank you so much! I forgot to mention, the stone has two small birds sitting on a branch facing each other. Awesome! Thanks for letting me know. I left it just today. We’re visiting my son here and staying for the eclipse. Hi i was in colorado and found a stone in rocky mountian park by a hot springs river very cool i am from Saranac Lake N Y i found a peacock its pretty cool ! Thanks so much for letting me know! I love hearing where the stones are found! found the bow and arrow stone at Paonia resavoir last summer,(sorry for not posting this before) in Colorado. this is such a cool thing you are doing, do you place the stones yourself or do you have other people doing it, I thought I saw a man and lady leaving this overlook on a motorcycle just before I stopped ? Hi Jerome! When the book released in July 2016, I had people all over the country placing stones for me. Now, it’s me, and that couple you saw leaving on a motorcycle was my husband and me! Thanks for taking the time to post this. You’ve given a great big smile! My husband and I were traveling along Upper Red Rock Pass in Sedona. We stopped at a dirt parking area to enjoy the sunset on Cathedral and Bell Rock to take a few pics. The ground was covered with lots of red rocks and I spotted the painted rock under some vegetation with an animal in the middle. I picked it up and thought it might be a wolf, coyote but recognized it was a javelina. We continued a few more miles and turned around to head back and twenty feet in front of the car 6-7 javelinas crossed from passenger side….though when we pulled up 2 were still in brush on my side. A friend had just sent pics of a group on the golf course near Scottsdale last week. So we were aware of what they were. Had never seen them close up. Janet – that’s an amazing thing to happen! When I leave a rock, I always know that the person who is supposed to have it, will find it! Thanks so much for sharing this with me. It was our first time in Sedona, and we had a wonderful time there. So much beauty! Hi Jeri. My son and I found a butterfly stone off Route 60 near Globe, Arizona. It was near an overlook and we had stopped to take photos and enjoy the view. It was the first day of our trip an it seemed like a good sign! I love hearing from people who find stones! I’m from Colorado and we did a quick four day trip to Arizona last weekend. I left several stones along the way. Thanks so much for letting me know, and I hope you have a wonderful trip! I am from WY, traveling to AZ around the 15 or 16 of March. Found your beautiful turtle rock on a trail in the amazing Salt River Canyon. It was magical, turtle is my totem animal! Blessings. Thank you for letting me know! I love that turtle is your totem animal and you found the one I left! I always say that the person who is supposed to find the stone, will find it. Blessings to you, as well.